*100 percent buckwheat soba noodles are whole grain. 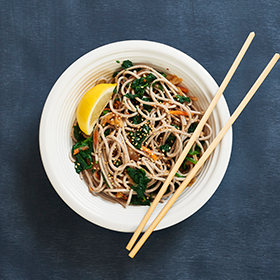 Other soba noodles may be a blend of buckwheat and wheat flour with varying amounts of dietary fiber and sodium. Nutrient analysis is based on 2 ounces of 100 percent buckwheat soba noodles with 3g fiber and 5mg sodium. Drain in colander, then rinse noodles under cold running water. Drain well, and divide soba between 2 pasta bowls. Add half sesame oil to each bowl, and toss to coat soba. Top noodles with half the spinach, kimchi and broth, tossing to combine them. Sprinkle on seeds, add lemon wedges, if using, and serve. Serving size: 1/2 recipe. Amount per serving: 294 calories, 8g total fat (1g saturated fat), 49g carbohydrates, 10g protein, 6g dietary fiber, 327mg sodium.